We have another new addition to the APS Archives, in the form of a postal card acknowledging receipt of dues for 1895-1896 courtesy of John Morris. 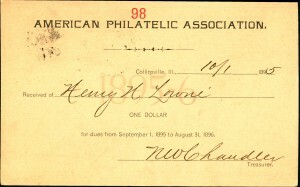 The dues for the American Philatelic Association (now the American Philatelic Society) at the time were $1. A receipt from this time period is interesting for another reason, because this is during the time when the APA assigned members new membership numbers. The number stamped on the card, 98, is the new number which is a stock certificate number. 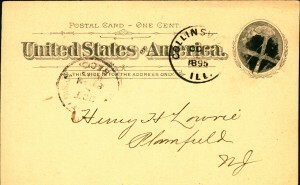 The membership list published in the February 1896 issue of The American Philatelist includes both this new number and the old number (416).